Brain membrane anatomy. 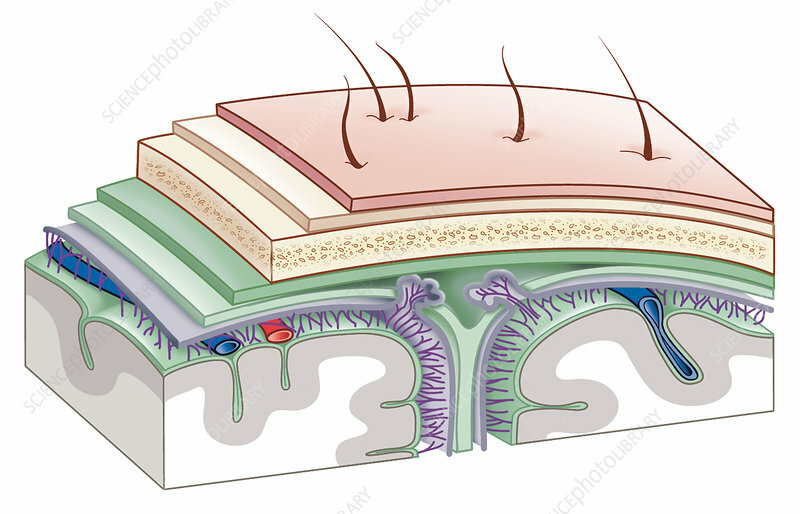 Artwork of the anatomy of the meninges (green), the membranes that enclose the brain. Areas of white and grey matter are at lower right and lower left. From inner to outer, the meninges are the pia mater, the arachnoid mater, and the dura mater. Above these are the skull, the periosteum, and an outer skin layer (pink) that includes scalp hairs. The space between the pia mater and arachnoid mater (the subarachnoid space) contains cerebrospinal fluid and filaments called arachnoid trabeculae (purple). Also shown are arterial (red) and venous (blue) capillaries, part of the blood-brain barrier.